Can You so easily tune in to the incredible ease of perception, approximately as in the childhood, without effort and special suggestions, simply voluntarily? We happily or sadly, but sometimes actually to see "all over again" as in the childhood, to find the ease and immediacy of perception. Return to the childhood probably is unlikely if person mentally healthy, but to find a fresh look on the long-known world is real. Look at an upside down image. Try to understand what it is, considering that for the vision all the conditions of perception is the same. Then look at the straight foto and try to understand the difference of upside down perception. What's going on? And that on the retina gets «upside down» picture. Sometimes the upside down picture to create serious difficulties for the normal perception. But better to turn upside down the dynamic scene which involves the person himself. For example, you can try to bring the mirror perpendicular to the forehead and look at the picture above to walk way or even try to grab something. The eye and the whole visual system actually very interesting. 90% information of the world around us we perceive through the eyes exactly! So, our perception can affect through eyes strongly. It is interesting to note that some objects such various household thingummies are normal upside down perceived. But nevertheless always in another way and more sophisticated things with perception of dynamic scenes exactly in upside down type. By the way, on the eye retina is formed by the upside down image of objects similar to the camera..
Actually, strange, isn’t it? Our brain is constantly at work to somehow adapt the inverted image to a normal life. I do not argue with nature - it is interesting to know more deeply and adjust yours behavior with appropriate "mother" laws. But there is a haunted the question of what actually will be if you turn back the picture on the retina? Do human brains get used to this strange? It is known that the first man on the planet about which there is information and who "fired up", invented and carried out a psychological experiment to upside down images on the retina, was an English psychologist George Stratton (Perceptual adaptation). It happened in 1896 - 1897 years., Stratton carried a special optical system (now known as Invertoscope - upside down goggles) during the first three days, then gave himself a break, and then continued to wear for eight days, that gave him the opportunity to create the upside down world. Using monocular invertoscope ( upside down goggles) he did not change his lifestyle and was engaged business as usual, including walking and even sort of forgot that he conduct an unusual psychological experiment. Stratton kept a diary. At the beginning of the experiment Stratton writes that he was lost in this strange upside down world, but after a few days, a bit accustomed, and only at the end of the week shook down and the world looked like a usual again . It should be noted that Stratton had a monocular invertoscope (upside down goggles) with one lens (who are interested, I can explain why, please Contact us) The second eye he covered with shield. Certainly he should go further and conduct tests with two eyes. So, approximately forty years later, after Stratton, J. Peterson already wore prototype of the modern invertoscope (upside down goggles) - overturning binocular glasses and spent longer psychological experiments. Here is a quote from his diary: "I saw my foot coming towards me on the mat, which was somewhere in front of me". I first encountered this strange visual impression how I myself, going to him. When I entered into a long corridor, I found that the floor looks like the cape, on both sides of which the walls are moving down. It was all the more strange that I could touch the walls with my hands. End wall in the the end of the hall looked like have nominated me, and the walls - moved away from it, although I touch them by my hands ". What kind of device it is that allows you to do with the perception such wonders just steep attraction? What kind of device it is that allows to feel yourself a psychologist experimenter? Invertoscope (from the Latin. Inverto - flip, drop, and so the Greek. σκοπέω - see) - it is called by every one like a inverting glasses, overturning glasses, reversing image glasses, prismatic glasses, inverting spectacles, upside down googles, upside down glasses, upside down spectacles, Inverse glasses, Umkehrbrille (Prismenbrille) Germany, occhiali di inversione Italy, 逆さま 眼鏡 Japan - all this is one device that allows vertical or horizontal invert (reverse) retinal image (inversion (turning) of the image occurs horizontal or vertical), and the mirror effect is achieved. Invertoscope (upside down goggles) is device that allows you to "test the strength of the" old riddle: "Why do we see the world right, despite the fact that the image on the eye retina is upside down?" So putting invertoscope, just imagine that you are in the upside down world behind the mirror. 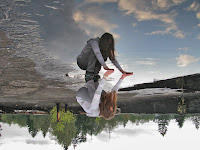 It is not just the familiar upside down world, it's a another reality for your mind. In this reality, all your familiar things and objects, as well as the people and events take an unrealistic view that leaves a lasting impression in your mind and really like steep attraction. Just look closely at how funny people go, when they are viewed from above, such as from the top floor of the house, and so in invertoscope (upside down goggles) it looks much more fun. Taking part in a live experiment while wearing invertoscope, you can know a very amazing phenomenas from your experience. And you can wear it for a long time and then it is a training device for the brain through the eyes. Clothing invertoscope (upside down goggles) all that you see moves with you, sometimes creating an carousel effect that the connection with the real world is losing, space and time, if not to remove the device for some time (15-20 minutes is sufficient, depending on the physiological characteristics of person). Very often the feelings while wearing invertoscope remind a free fall ride, sometimes it breathtaking and you need to hold on for something! It is really leaves a special impression. After some time of wearing invertoscope may come some right vision, nonetheless different from the not inverted, the process of adapting to this conditionally over. Taking off after extended wearing of invertoscope reality may appear some time not so familiar, but do not be afraid, because everything will return back. It should again walk without the device for some time and again will be fun and interesting to repeat the adventure. The person wearing invertoskop, begins to understand the difference between the visible world the one that we are accustomed from the visible field so called field of view, which can see, for example, the professional artists on their own. This understanding is very funny, but you need to tune your perception with invertoscope - upside down goggles. However, if the artists are trained to perceive the visible field especially long and hard, or are born with the talent, perfecting the skill all life, then you can immediately perceive it, and quickly learn to see how artists and without the device. You need to learn specifically to draw, however the artistic vision training is an important stage of becoming a talented artist. Using invertoscope, you can once again get the sensations that are very close to the first moments of life after birth, to make the first steps to learning your own body orientation in space with the help of view. Invertoscope is a kind of "button" that controls your perception and using of this "ancient" perception management device, the reality can be really bright and rich, happy and conscious. 1. Stratton G. M. 1897. Vision Without Inversion of the Retinal image. «Psychol. Rev.», 4, 341—360.